Patients using BlueStar typically achieve a 1.7 to 2 points average decrease in HbA1c in the first 3 to 6 months of usage. Indications for use: BlueStar® and BlueStar Rx® Systems are indicated for use by healthcare providers and their adult patients – aged 21 years and older – who have type 2 diabetes. Outcomes: Demonstrated through 37 different peer-reviewed, clinical publications, studies, and posters (including 2 multi-site, randomized controlled trials), patients experienced a drop in HbA1c of 2 points on average, improved medication adherence, and better glucose control. What to expect: Lowers blood glucose levels for adults living with type 2 diabetes. Directions: Patients can either use the mobile app or the web version of BlueStar. The mobile app uniquely works on- or off-line, to address the requirement for “always-on” support for FDA-mandated patient safety requirements. Patients will be encouraged by 30,000+ automated, tailored, and unique coaching messages which empower users to make the most of every minute. Users will take in real-time therapeutic actions – including daily medication administration, physical activity, smart food choices, and psycho-social well-being – based on recommendations provided by the program that are driven by evidence-based guidelines. Risks & warnings: BlueStar is not currently indicated for patients with Type 1 diabetes, or who are under the age of 21, or who are currently pregnant, or who use a continuous glucose monitor. Place in therapy: Complementary to current therapies including pharmacologic-related, diet-related, exercise-related, or knowledge-related therapy pathways. Product description: BlueStar includes an always-on, fully-automated software coach; a SmartVisit™ report that goes to the patient’s healthcare provider team via fax, email, or EMR; and a population management portal that allows an administrator to manage, review, report, survey, and dialog with patients or cohorts of patients. Prescription status: BlueStar does not require a prescription unless patients intend to use BlueStar with an insulin titration system. 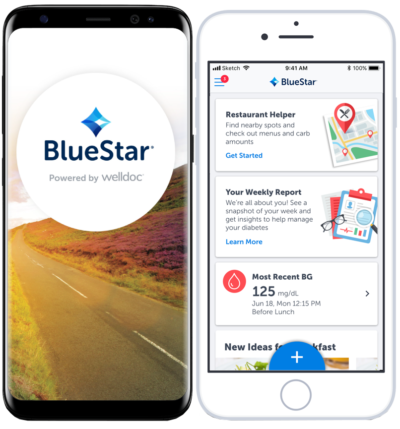 Patient access: Patients download the BlueStar Program through an app on the Apple or Google App Store. An enrollment code is generated for patients after their healthcare provider completes a prescription or enterprise makes it available (OTC). Provider access: Healthcare providers may access the BlueStar SmartVisit report or Care Management Portal to monitor for weekly and monthly health trends, potential medication-related issues, and view patient-generated health data. BlueStar is also integrated with many major EMRs to ensure that data is securely shared with the patient record. Coverage options: BlueStar is typically paid for by insurance plans and employers. BlueStar uniquely offers highly tailored and clinically validated real-time coaching and longitudinal insights that are driven by an artificial intelligence expert system. 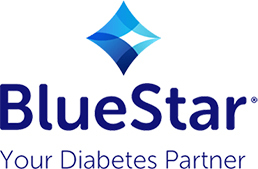 BlueStar is also unique because it focuses on self management for the patient but also a strong connection to the patient’s own care team – both critical to A1c reduction. It was the first digital therapeutic to undergo randomized controlled trials and obtain clearance from the FDA. WellDoc™ Mobile Diabetes Management Randomized Controlled Trial: Change in Clinical and Behavioral Outcomes and Patient and Physician Satisfaction Randomized controlled study; IRB-certified study The clinical evidence shows a 2.0 point mean A1C reduction for individuals living with type 2 diabetes who used BlueStar. Glycemic Control: Impact on Physician Prescribing Behavior Randomized controlled study; IRB-certified study The clinical evidence shows a 1.9-point mean A1C reduction for individuals living with type 2 diabetes who used BlueStar.